Niagara Falls is breathtaking by day when the full sight of the falls can be taken in. It was a logical step for people to start wondering how this experience could be translated into night-time. And the Niagara Falls Illumination (the official name for Niagara Falls Light Shows) has become a major drawing card for tourism for close to a century now. The idea of illuminating the falls at night is an old practice. As early as 1860 there have been elaborate programs in place to throw light and colour onto the cascading water – in this early case, it was to welcome the Prince of Wales to Canada and used two hundred lights placed along the waterfalls’ banks. 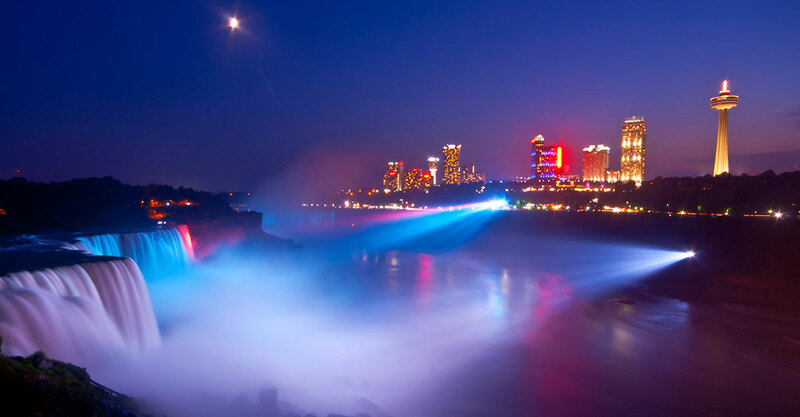 The Niagara Falls Illumination Board has been running since 1925 and has developed the early practice of illuminating the falls into a much more sophisticated array. This group is funded by the Niagara Parks Commission as well as Niagara Falls city councils from both sides of the US-Canada border. Under the care of the Illumination Board, the lights that illuminate the falls at night have kept up to code with modern technology over the decades. Currently, the main equipment is twenty-one Xenon lights, acting as coloured lamps and shining on the falls from various vantage points around the waterfalls. As an indication of their strength, each Xenon lamp has a brightness factor of 250 000 000 candles. These lamps aren’t just plain white lights either. Every night the falls are bathed in waves of colour and hue. Generally, it’s a multi-coloured and rainbow array, but a special illumination schedule is in place to allow private companies to ‘book’ a time to colour the falls for a certain theme, such as for St Patrick’s Day (green) or the Make-a-Wish Foundation (blue and white). The falls are illuminated all year round, but the schedule can vary throughout the seasons. The times are later and shorter in the spring and summer as the days grow longer, until starting as early as 5 pm nightly from November until early February. Falls Illumination is perfectly viewed year round from a Marriott Fallsview Room. Combine the Illumination with the regular fireworks displays that might take place above the falls, and it becomes an unforgettable spectacle.